We’ve been hearing from a number of BBC leavers asking about what’s happening to our rather well-known ‘setting up as a sole trader’ course. This is because the BBC Careerlink service, which has been buying in our courses, shut at the end of March 2017. Leaver support is being outsourced to a private provider, LHH Penna, from April. So here’s an FAQ page which might help you or your colleagues who find themselves looking for our ‘sole trader’ course. 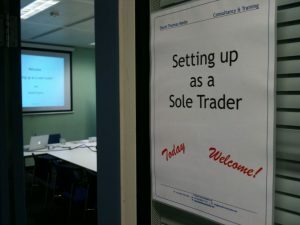 Will the new supplier offer David Thomas’s sole trader course? No. They have their own generic self-employment modules which they prefer to offer to leavers. Can I get the sole trader course elsewhere? Yes you can! We now run a sole trader course for people going through redundancy from the BBC and other places, like ITV. The course is aimed at people setting up on their own in any kind of small business, not just media or production work. I see you also run ‘Finance for Freelancers’. How is that different from ‘Setting up as a Sole Trader’? We regularly run ‘Finance for Freelancers’ courses through unions and other bodies around the UK. These are aimed at people already in production or creative industries, or just entering these industries. It’s specifically aimed at freelancing in production or theatre. It’s just as useful for experienced freelancers as for newbies. How can I find a Finance for Freelancers workshop? All confirmed dates are publicised on twitter (@dtmtraining) and on this site on the courses page. We also have a newsletter, which you can sign up for here. Will future courses still be free? Some of our clients have to charge for courses to cover costs. Some provide free courses. If you’re a member of the NUJ, Musician’s Union, Equity or the Writer’s Guild you can access free courses via feutraining.org. We usually provide a couple of Finance for Freelancers courses a year for clients like the FEU or BECTU. I was on a BBC course previously. Can I still get my handouts and templates? Yes. Just because Careerlink has closed, it doesn’t affect the support you will get from us. The downloads and support from David will be here for you as long as David Thomas Media exists. What about your finance training for BBC schemes such as the PTS or Creative Interns? These are funded in a different way and will be continuing as normal. Write them below and we’ll try to help. Keep in touch! Pensions Dashboard? Not much dash. Lots of bored. End to late payment problems? Have you got a tax hangover? Budget 2018 – what does it mean for freelancers and self-employed?